RePEc is foremost a initiative to enhance the dissemination of economics research. IDEAS is one of several RePEc services that make the RePEc bibliographic database available to anybody. This tutorial demonstrates how IDEAS can be leveraged to perform powerful literature searches. A good starting point can be to do a search for some keyword. A search on IDEAS can be much more useful that a search on a more general tool as IDEAS is dedicated to economics, thus results should not be “polluted” by results from other fields or that are not research. Say you are interested in some economic aspect of elephants (an example actually requested in a live demonstration). Then search for “elephant” is sufficient to give you all the economic literature on the pachyderms. There is a search form on every IDEAS page in the top right corner, and there is also a dedicated page with advanced options. At the time of this writing, a search for “elephant” yields 298 results. For the following, we will use as an example one search results that caught our eye: Downward sloping demand for environmental amenities and international compensation: elephant conservation and strategic culling, a working paper. Another way to find a starting point for your literature search is to browse by topic. For this, we have the JEL Classification from the Journal of Economic Literature. While by far not every item in RePEc has a JEL code, this again can be a useful starting point. This may require quite a bit of exploration for the newcomer, as one may have to navigate several branches until one finds the right topic. Or there may not be a close fit. For example, the economics of elephants does not have its own code in the JEL classification, it is somewhere in code Q. Another way to browse is to look at the publication profiles of the authors of the studies you have found. Often, at least one author is registered with RePEc and has assembled all their works into their profile. There may be other relevant items there. RePEc tries whenever possible to extract the references in the indexed works and then tries to link those references with the holdings in RePEc. This process is fraught with stumbling blocks, but it worked in our example, as can be seen below. References typically contain the most relevant literature that preceded the work that is considered. These works are likely to be important. And as you browse or follow the references, you will start noticing that the the same works keep appearing. These should most likely be part of your final list. As we have references, we can also do links the other way: where has this work been cited? This provides you with the literature that follows the work that is considered. And indeed, our example has been cited elsewhere. You can then explore these works, what references they have and what their authors have also written. Sometimes, you cannot access a particular work because the publisher requires a subscription. However, there may be a previous version available that is in open access. In such cases, IDEAS will tell you with a red message that you can find a link in the “related works section” as in the example below. The links also work the other way: while looking at an open access version, it allows you to find where it was ultimately published. In some cases, it even allows you to find associated data or computer code. If you want to continue to follow the literature you are interested in, there are several options available to you. See this blog post to learn about them. One of them it to use MyIDEAS, which can also be useful when you are doing your literature search, as is allows you to save items into folders as you work on IDEAS and then export the bibliographic references in various formats. Two months ago, we announced a new free RePEc service that allows RePEc users making a fragmentation/annotation of papers and linking whole papers and/or their fragments by scientific relationships. These new tools are publicly available at sociorepec.org. It can help researchers with their everyday academic work, like discovery, analysis, and writing of new papers. Using these tools researchers create private or public micro research outputs (annotations, relationships, etc.). If it is public, SocioRePEc can initiate direct scholarly communication between the researchers who used some papers to create micro outputs and the authors of the used papers. Such direct communication takes place while researchers are collecting findings, manipulating and organizing the findings, e.g. as their manuscripts. Thus, researchers have an opportunity to come to scholarly communication before the manuscripts become traditional publications. We call this the pre-publication communication. Recently we presented our vision of the possible impact of pre-publication communication in a position paper “End of Publication? Open access and a new scholarly communication technology“. We are looking for partners (organizations or individuals) to explore the pre-publication communication. 1. Competitive selection. The basic pre-publication communication provided by SocioRePEc is public. That means the system allows experiments with creating some elements of competition. Members of the research community can trace the “author”<–>”user” pre-publication communication. Then they compete with the author by offering the user better research results or more efficient solution to her/his research problem. 2. Identification of the “neighbours”. We can think of researchers using research outputs of other researchers as “neighbours” in the global scientific labor division system. Pre-publication communication can help researchers to find out who their neighbours are. This can give the neighbours better collective intelligence. They can interactively adjust and adapt their “supply” and “demand” to get better mutual impact from their direct research cooperation. 3. Exploring challenges. Do researchers appreciate that pre-publication communication is an instrument for identifying problems in and reducing potential issues of the credibility of their work? To shed some light on this question we need some additional qualitative study on how a research culture (formal and informal norms, rules, and motivation) can be developed that can lead researchers to adopt pre-publication scholarly communication. 4. Publication as aggregation. It is also important to find out what could motivate scholars to adopt the idea that the future of research publication is aggregation. Neylon wrote about this: “If we think of publication as the act of bringing a set of things together and providing them with a coherent identity then that publication can be many things with many possible uses” . Possible questions for the experiments are: What kind of forms in general can research outputs usage have in, say, economics? Will researchers agree to share micro research outputs in order to benefit from the pre-publication communication? Under what circumstances could researchers adopt the idea of “publication as aggregation”? 5. Transparency in research. What changes in research practice can initiate global pre-publication scholarly communication between authors and users of research outputs? How can this improve the transparency and credibility of their research findings? Answering these questions will imply some study of, for example, the community of RePEc users. We see them as a pro-active group of scholars open to innovations in the field of global scholarly communication technology. We rely on grant support, sponsorship and community donations to get started. Please consider making a donation or support us in another form (email for contacts). As more and more people are using phones and tablets to surf the web and in particular to consult the RePEc websites, IDEAS has just moved to a new layout that is more friendly to such devices. Specifically, the display adjusts to the size of the browser window. We hope this will make it easier for our numerous mobile users. Other RePEc websites will follow. Note that some IDEAS pages will still show the old layout. It takes some time to convert 2 million pages. If anything looks amiss, contact us! Or visit us at the ASSA 2015 meeting in Boston, at the St. Louis Fed booth in the exhibitor hall. In a previous note I described use cases of publication enrichment and gave information how to find out your publications at Socionet experiment with this new service. The following note provides instructions on how to log into the system. When you browse publications at Socionet you may see in its menu the following option: “Unknown user – please login”. This appears any time you are not logged in to your account. If you have an account at RePEc Author Service (or at Socionet Personal Zone) you can click on “please login”. Then you get to a login page. It has a form for RePEc users, as shown below. Here you enter your Short-ID provided for you by the RePEc Author Service. 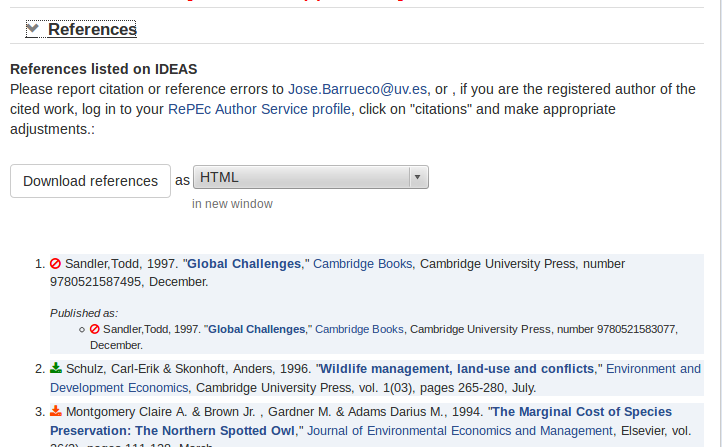 After pressing the button “Log in through…” you will be moved on the RePEc Author Service identification form. When you are thus logged in as a RAS user at Socionet you can create an unlimited number of enrichments (linkages and annotations) for any publication available at RePEc and Socionet. All the data you create are saved by default into your personal storage on the Socionet server. You can check your current stored content by clicking on “Created linkages” in the services menu as seen above. If there is at least one created linkage you will see a table like this. Titles of linkages in this list are generated by software and consist of handles of the linked objects and the specified semantic. You can delete linkages by using check boxes on the right. Once a day (each night by Moscow time) the system synchronizes the current content of this storage with the public data base of Socionet. So if you create new linkages (or delete existed) they will (dis)appear on pages of enriched publications after night updating procedures. Usually it is finished about 8-9 am of Moscow time. The Socionet administrators – currently it is just me – receive notifications about newly created personal storages. They make a decision about switching on its harvesting to the public Socionet database. In a case of non-proper user behavior the administrators can stop publishing our personal storage in the public site and they can delete your data from the public system. In his recent post Thomas Krichel discussed some new Socionet facilities for authors which technically work as a creation of semantic linkages between different RePEc entities (papers, personal profiles, etc.). As Thomas mentioned at the moment we, i.e. the Socionet team, are opening these new facilities to RePEc users for experimentation. The easiest way to get to take part is to have an account at the RePEc Author Service (RAS). I have a conference paper with the technical details. 1. You can specify the roles of your co-authorship in the making of a collective paper. The idea for such a facility and initial taxonomy of author roles comes from a Nature commentary (http://www.nature.com/news/publishing-credit-where-credit-is-due-1.15033) as well as from the CRediT project. The Wellcome Trust, Digital Science, CASRAI, and NISO as members of this project that has also started a survey on the Standardized Taxonomy for Contributor Roles. 2. You can make some updates to the way your paper is described. It can be done in two ways: 1) by annotating text fragments of a paper’s abstract to provide readers with additional and/or newer information on the topic; and 2) by linking a paper to its newest versions, and/or to related papers that appeared later. 3. You can link your paper to show to readers an evolution of ideas or a development of approaches through a set of your papers. 4. You can contribute data on how the works referenced in your paper are used. 5. You can make recommendations to and/or share useful information with registered authors whose papers you are looking at. In this case your proposal will look as a linkage with some taxonomy between some of your papers and the one you are currently reading. 6. You can establish relationships of scientific development or complementarity between your paper and the one you are currently reading. 7. You can issue your professional opinion about another paper by using a specific taxonomy. You can look at one of my papers where I made some enrichment. You will see the implementation of above points 1, 2, 3, and 4. I plan to publish at the blog notes with instructions how to test each use case listed above. It will provide discussions about taxonomies that we used, user interfaces that we built and so on. We would like to have feedback from the community on this new technology and on created new opportunities for scientists. I see a lot of benefits for the research community related with further development of this approach. If you have your account at RePEc Author Service, you can open your publications at Socionet, log in, and make experiments with its enrichment right now. See also detailed instruction on how to log into the system with your RAS short-ID. Note: at Socionet pages of papers, personal profiles, etc. at the right top corner there is a link to switch on the another language version. The link will be “[eng]” or “[рус]” depends on which language version is now opened. You are currently browsing the archives for the RePEc features category.